When Jesus called his disciples together in Caesarea Philippi to inquire about whom the people considered him to be, he made a solemn promise to build his church (Matthew 16:15) affirms the universality of the church. The scriptures frequently refer to the church in a universal sense, encompassing the entire family of God throughout the world. The New Testament also frequently refers to the church in a local sense. Many of Paul's letters were directed to the church in a particular city (Romans 1:7; 1 Corinthians 1:2; Philippians 1:1), or region (Galatians 1:2). Christ's church may well be described as a monarchy. Other than Jesus, the absolute monarch and head of the church (Ephesians 1:20-23), who possesses all legislative authority (Matt. 28:18), the New Testament authorizes no organization for the universal church. In the absence of any Biblical authority for organizing the church universal, any assumption of authority beyond the local congregation constitutes a government not sanctioned by the scriptures. In his divine wisdom, God did not permit ambitious men to wield undue influence on the church universal. Jesus emphasized humility and service to others as character traits of those great in his kingdom. Ambitious men seeking power over others through an organizational structure greater than the local church runs contrary to greatness as God sees it. 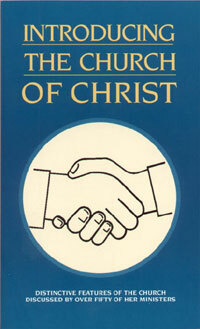 The scriptures, however, do present God's plan for the organization of the local church. That all things might be done decently and in order, he commands the selection of a plurality of men in each congregation to serve as shepherds of the flock. These men are scripturally described as elders (1 Peter 5:1), bishops (Phil. 1:1; 1 Timothy 3:1), the presbytery (1Tim. 4:14), overseers (Acts 20:28, KJV), or pastors (Eph. 4:11). The divine wisdom of God was demonstrated in making each local church self-governing under Christ. Each was to have its own leaders. In Acts 20, Luke records Paul's meeting with the elders of the church in Ephesus (v. 17). Paul gave these men the solemn charge to "Take heed unto yourselves and to all the flock, in which the Holy Spirit hath made you bishops..."(v. 28). When writing to the church in Philippi, Paul addressed his letter "to all the saints in Christ Jesus that are at Philippi, with the bishops and deacons" (Phil. 1:1). To Titus, Paul said, "For this cause left I thee in Crete, that thou shouldest set in order the things that were wanting, and appoint elders in every city, as I gave thee charge" (Titus 1:5). Each church had its own elders. The elders in each locality had specific responsibilities to teach, oversee, rule, and be examples to the flock of God under their care. Each congregation functioned with a plurality of elders. The elders in one city, or congregation, had no responsibility or authority in another city. Likewise, all elders in a congregation had equal responsibility and authority in that congregation. The organization God planned for his church was simple. A plurality of men qualified by character and experience (1 Timothy 3:1-7) were to be chosen (Titus 1:5). The plan did not include a modern "single pastor" system. It did not include any individual with authority and responsibility beyond his own congregation. It did not include a "bishop" elevated above the other elders or bishops. Other forms of government such as are now practiced by many religious organizations with their synods, general assemblies, councils, conferences, presbyteries and the like did not develop suddenly. The departure from the New Testament pattern in organization began early in the history of the church and has gradually evolved into the many forms of organization used today. However, any deviation from the New Testament pattern must be rejected for what it is -- a deviation. One of the first departures from the New Testament pattern was the development of the monarchal bishop. One man from among the elders accepted the title of bishop (a term scripturally referring to an elder) and was elevated above the rest. He became chairman of the elders." One by one, monarchal bishops were ordained until around 150 A.D. it became a generally accepted practice. The position of "bishop" continued to gain prominence as churches evangelized their surrounding areas. The church in a large city, such as Rome, Antioch, or Alexandria, would begin a church in a smaller city and, with a sense of paternal responsibility, the bishop accepted the oversight of the new congregation. It was natural that the monarchal bishops in the larger cities wielded a great influence. The gradual development of synods resulted. Ultimately, religious authority emanated from Rome, perhaps partially because Rome was the seat of political power. With the establishment of monarchal bishops, these men met in councils as representatives of their respective congregations to consider their common interests. It was not long, however, until the bishops saw themselves, not as representatives, but as authorities to dictate to the churches. The bishops' conclaves were described as councils or synods and the resulting regulations were known as canons or rules. Late in the second century there were attempts to establish a succession of bishops back to the apostles. This attempt shows the undue authority the bishops were accepting. To trace their lineage back to the apostles had the effect of placing them on an equality with the apostles. The selection of monarchal bishops was far more than an insignificant deviation from the pattern. It became the beginning of an organizational system which eventually evolved into the hierarchal form of government seen in Catholicism today. The ultimate assumption of power came in 1870 when the Vatican Council declared the doctrine of papal infallibility. When the courageous reformation leaders came on the scene seeking to reform the apostate church, the result came to be known as Protestantism. Many of the Protestant groups were influenced by the Roman hierarchy and retained various elements of its polity after they broke away. Others, preferring different organizational structures, adopted forms of government which seemed good to them. The result is the diverse methods of organization seen in the religious world -- many of which cater to the pride and ambition of men but do not resemble the simple command of Paul to "ordain elders in every city" (Titus 1:5). Churches of Christ today plead for a return to the organization of the church of the New Testament. Jesus Christ is the absolute monarch and sole legislator. A plurality of elders with equal authority and responsibility in each congregation and with no authority beyond their local congregation oversee the affairs of the local church under Jesus, the chief Shepherd (1 Peter 5:4). All children of God throughout the world are brothers and sisters in Christ -- with no clergy or laity distinctions -- but each congregation must be autonomous, working within the framework of the simple organization described in the New Testament. The term "church" is used in what two ways in the New Testament? To what extent is the universal church organized? To what extent is the local church organized? Where does legislative power in the church reside? To what did the term "bishop" originally refer? How was it changed?